Tomato rice. From the name it appears to be a simple, self-explanatory dish. It has tomato and rice, but not just that. I usually make it south-Indian style and often when I don’t know what else to make. It is tough to whizz up new, interesting recipes everyday, when there are two meals to cook. I know! Sounds (boastful and) like we live super healthy. Of course we don’t! Anyway, coming back to the dish. I re-discovered this recipe when it was an oft-repeated request from my cohabitant in reply to my constant quest for dinner or lunch ideas. By now, I’ve made it several times, sometimes with additions like sambar masala, leftover tomato salsa or even tomato ketchup. And each time I have found that it is simple enough to prepare in 15 mins and needs ingredients that I almost always have in the house. It makes for a lovely lunch or a light dinner if you’re not too hungry made all the more satisfying with some south Indian filter coffee and poppadom. 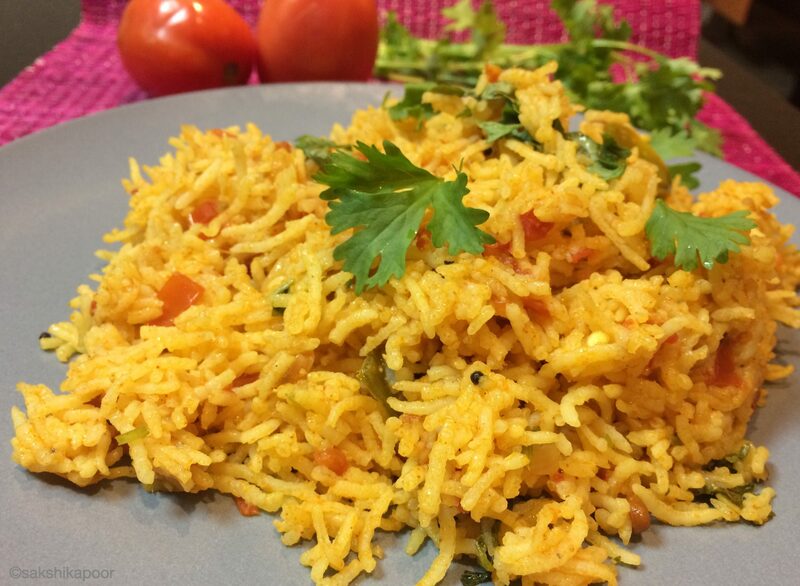 Here’s how you can make this quick and easy south Indian style Tomato rice! Start with keeping a big wok or pan on medium heat. Add oil and once it heats up add mustard seeds. Wait for the mustard seeds to pop and crackle. Sounds lovely doesn’t it! Add the chana dal and cook for say half a minute. 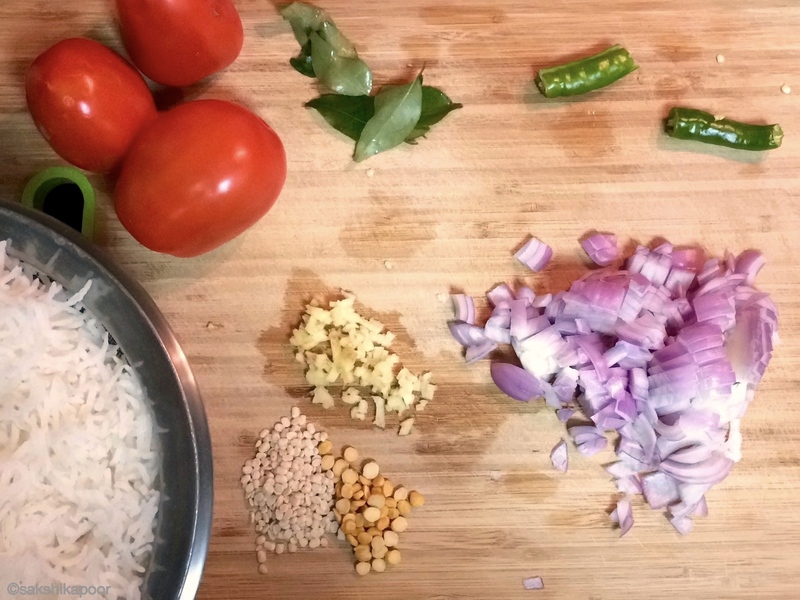 Follow with the urad dal and cook for another minute. When the dals turn golden brown, add the chopped ginger and sliced green chilli. Careful of the splash! Told you! Cook for 2 minutes more and then add the chopped onions and curry leaves. 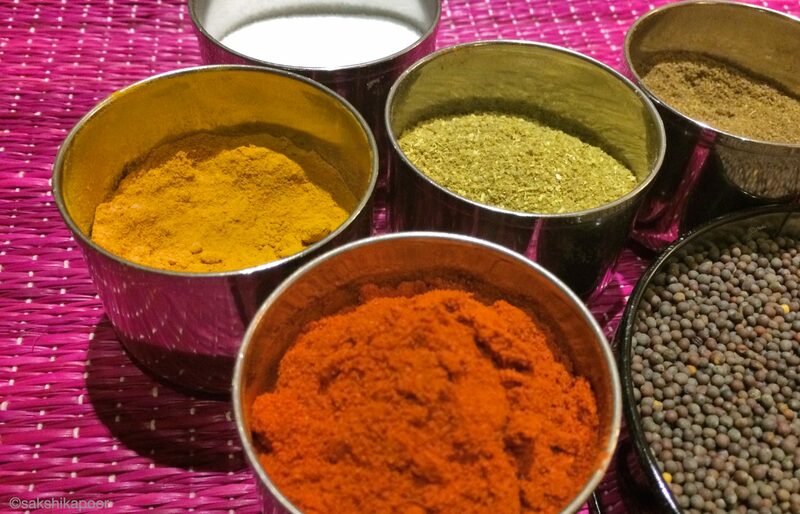 Stir these two in the wok and you’ll discover the kitchen smells like a south indian coffee-house. Relish these smells but concentrate. Cook the onions till they start becoming a little translucent. Follow by adding the tomatoes, either puréed or chopped. I’ve tried this recipe with both chopped and puréed tomatoes and discovered that puréed tomatoes coat the rice better and more evenly. But if you don’t use a food processor it is perfectly fine if you use chopped tomatoes, just make sure the tomatoes are ripe and finely chopped. One could also go on and discuss what variety of tomatoes to use, beef or roma or the Indian desi that is super juicy and tangy, but I’d leave that to you. 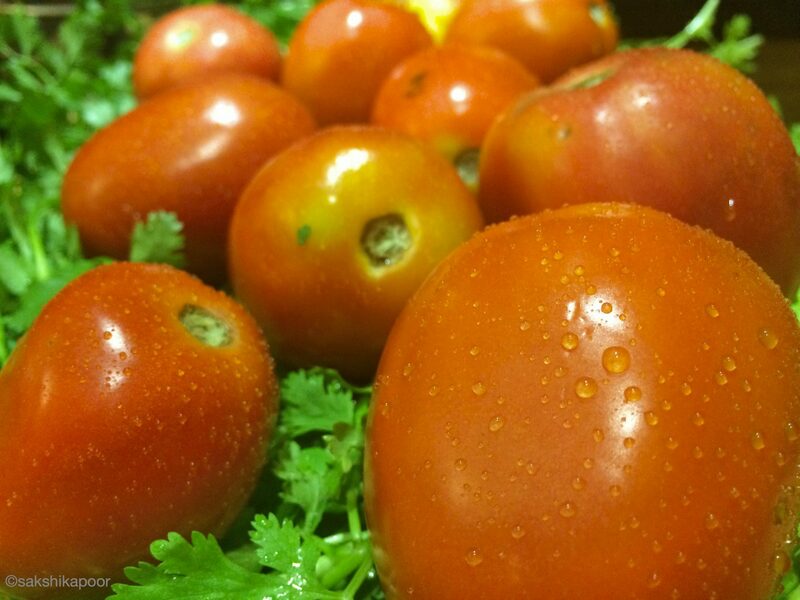 I mostly use roma tomatoes that I find easily in the supermarket near me. I’d love to use the desi (Indian) variety which is tangier than any other I know but I seldom get my hands on them here in Dubai. You can use whichever tomatoes you like. Once you have added the tomatoes add the spices- salt, turmeric, red chilli powder and coriander powder. The salt helps to cook and soften the tomatoes faster and the spices need to play around in the wok for sometime too. So be patient. Keep the heat on medium so that the spices don’t burn. Stir these in and let it cook for 2 more minutes. Once you see the tomatoes softening or leaving some oil on the sides, add water and let the mixture simmer for 2-3 minutes. Once that is done, add rice and mix well. You can cover the wok with a lid for 5 minutes on low heat so that all the flavours are soaked up by the rice. Garnish with freshly chopped coriander and serve hot. 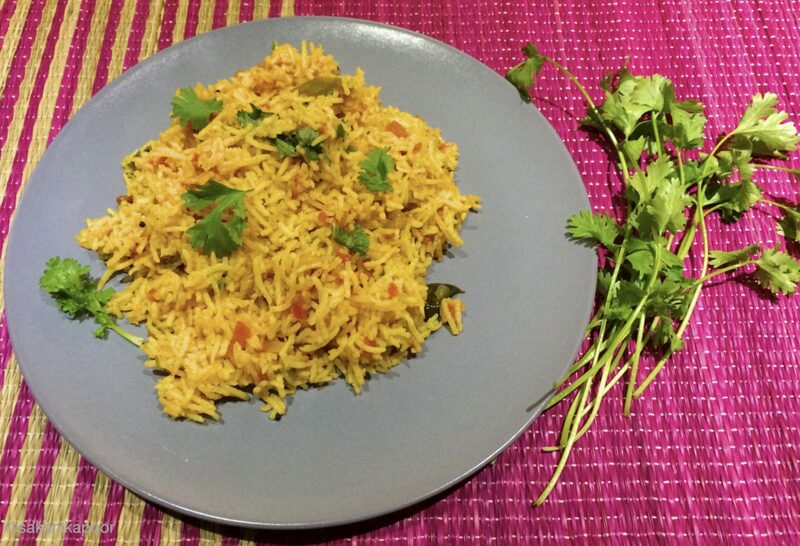 A plate of tangy and satisfying Tomato rice is ready! Thank you Pooja! 🙂 Stay tuned for more deliciousness.